There are some little known attributes of laminate flooring that this article will help you to understand may not fully understand. Venicia, one of Mannington’s Revolutions Tile collection, is an example of just how realistic laminate flooring can appear with its sleek marble look, 12 x 24 size and thin grout lines. AN EYE ON DESIGN. First and foremost, you want your floors to look great, and laminate flooring has more versatility of design than any other type. High-end laminate patterns are sometimes created by scanning the natural material in high-def. These images are then digitally enhanced, making a perfect, and perfectly natural, floor every time. And thanks to technology advances, the patterns can also have realistic texture and grout lines as well. UNBEATABLE DURABILITY. Better quality laminates are made with super-strong, high-density fiberboard that can withstand denting from even the heaviest pieces of furniture. And the melamine surface is impregnated with aluminum oxide, which is second only to diamonds in hardness for incredible wear, scratch and stain resistance. EASY MAINTENANCE. 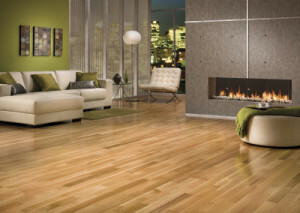 Laminate flooring is as close as any homeowner will ever get to a maintenance-free product. Occasional cleaning with a cloth mop is all you will ever need to do. Bigger messes—paint, nail polish— come clean with alcohol or nail polish remover, and wax or gum can be gently scraped away, all with no residual damage to the floor. INSTALLATION IS A SNAP. Today, most laminate is “glueless,” which means planks are designed to be clicked together and fastened without the use of nails or glue. This floating floor can be laid on top of almost any existing flooring (except carpeting). A cushioned underlayment keeps out any moisture that rises from the subfloor, provides padding for walking comfort, adds a bit of insulation and dampens noise. ENVIRONMENTALLY FRIENDLY. Laminate’s got a lot going for it in this area. It contains over 70% pre -consumer (postindustrial) recycled content, and at the end of its life in a home can be recycled or burned in a waste- to- energy system. The installation is glueless and, in the case of direct-pressure laminates, so is the manufacturing system. That helps tremendously with indoor air quality, a concern of many homeowners, particularly those with allergy concerns or young children.